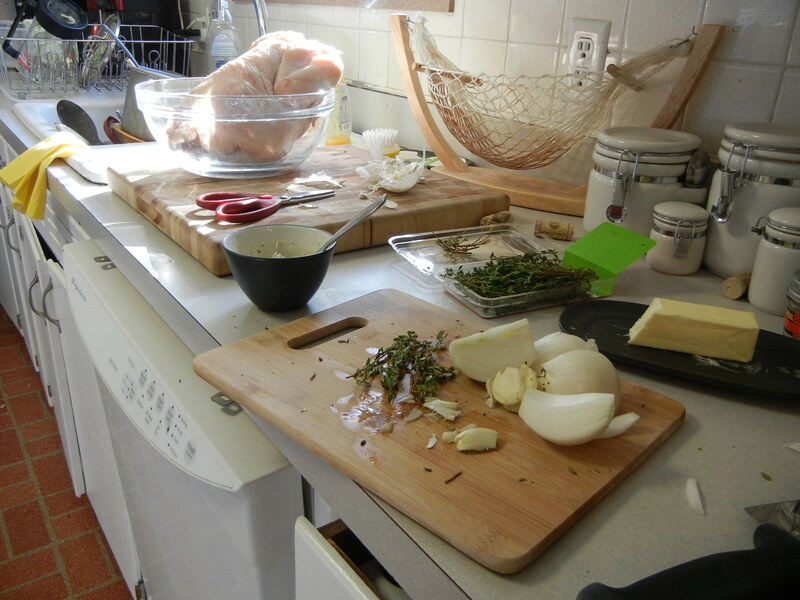 A while ago, I got a wild idea that I wanted to roast a whole chicken. Long story short, it was delicious, and is now something I do quite frequently. Whole chickens are fairly inexpensive, and if you pay more than about a dollar a pound, you are probably getting a little ripped off. I will add this disclaimer: roasting a whole chicken has its gross moments and so those who are faint of heart or stomach may not want to attempt this without a stronger stomached assistant. 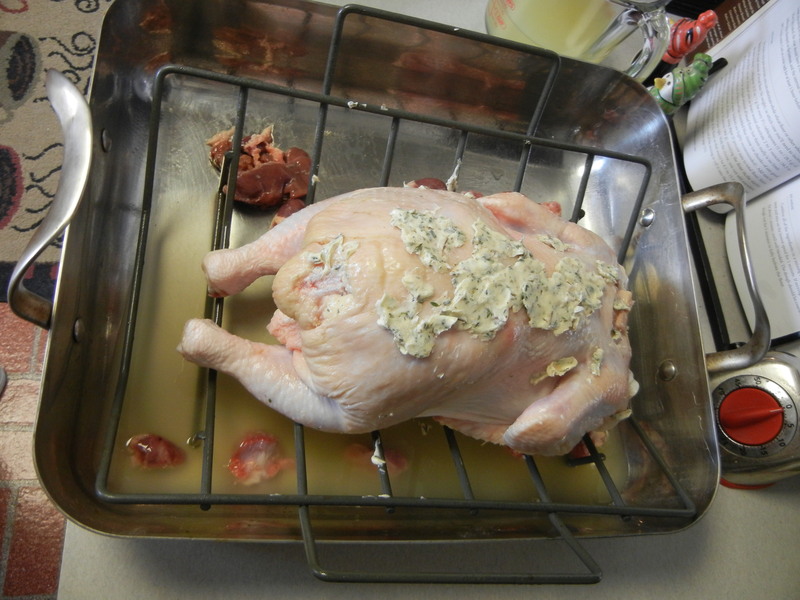 Also, this post contains photos of raw, whole chickens. Just saying. I also suggest having an empty dishwasher (or slightly full of dirty dishes) before starting this process. Of course, I never do this, I just realized halfway through that it would be nice if I could put those chickeny dishes straight into the dishwasher. Instead, I put them into the sink, which means I have to touch them again. 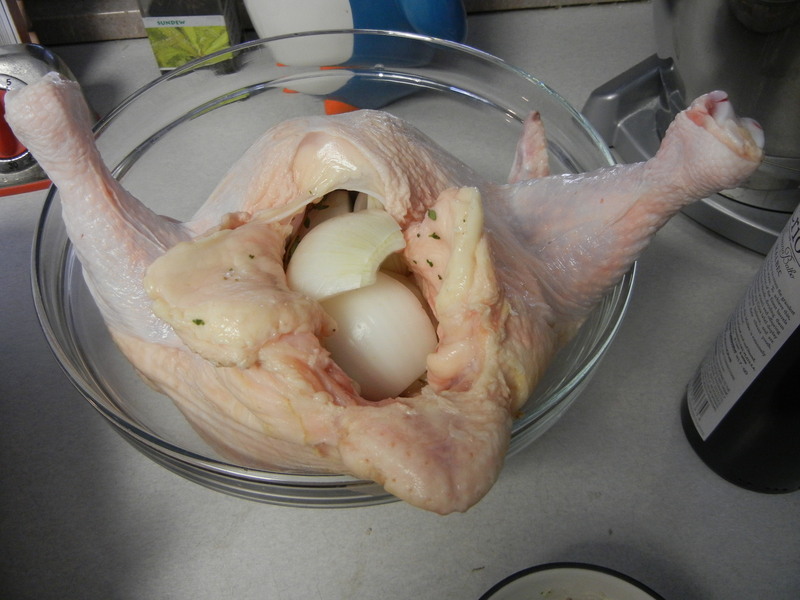 First, make sure the chicken is thawed and take out all the extras inside. They may be in a bag or just loose in there. Put those in the bottom of the roasting pan. The first thing I do is stuff the chicken. I always always ALWAYS stuff the chicken with an onion. First of all, yum. Second of all, it adds a nice moisture. You don’t eat the onions at the end. Well, I guess you could if you really wanted to, but we never have. I also add at least three cloves of crushed fresh garlic. This time, I added a few sprigs of thyme, too. Flavor ready to go in the chicken. This chicken is full! Some places suggest tying the legs together. You can if you want, but I can't ever seem to find kitchen string so I don't do it. Next, you rub the outside of the chicken. This time, I rubbed it with softened butter mixed with thyme, parsley and oregano but you can add any combination of herbs that sounds good to you. Some recipes say you should rub the chicken and then let it flavor through over night. This is a good idea, but the last time I did it I forgot and it still turned out well. 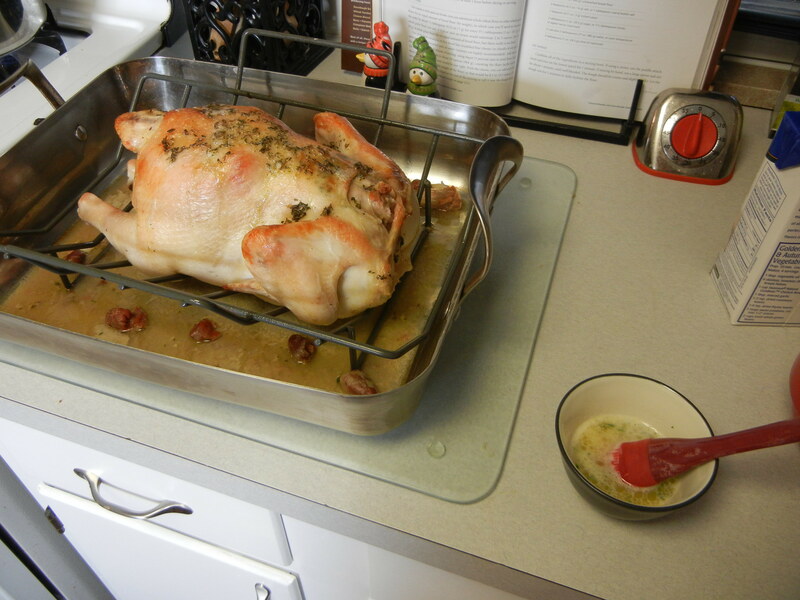 Be sure to rub your seasoning all over the chicken and between the skin and breast meat of the chicken. Check out my original recipe (mentioned below) for a really savory, unexpected combination of flavors. The original recipe I used didn’t call for anything in the bottom of the pan. The one I use when I roast potatoes with it does. This time I added 1.5 cups of chicken stock and a touch of white zinfandel (which someone had left at our place. We don’t really drink sweet wines, so it therefore becomes cooking wine) The little bit of the moisture in the bottom a) helps keep the chicken moist, b) gives you a nice start for some gravy and c) can sometimes keep the bottom of the pan from getting too burnt. Next, grease your v-rack if you are using one and put the chicken in the V breast side down. I put it breast side down because that’s the way I did it the first time. I know there are other schools of thought. That’s the way I did it the first time. It worked great. That’s the way I do it. I also do not tress the chicken. When your chicken is all ready to go, it’s time to bake it! I LOVE this cooking method. It requires you to pay attention, but I generally am working diligently on side dishes when I roast a chicken anyway so it isn’t a big deal. 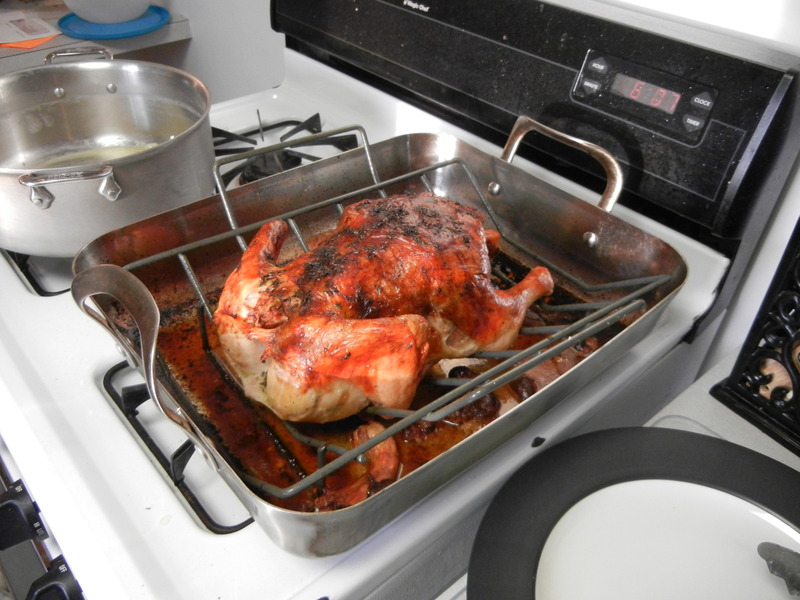 I think that this cooking method is really the key to a successfully roasted, deliciously juicy and flavorful chicken. Preheat the oven to 500 degrees. Put the chicken in for 15 minutes. Turn the oven down to 450 and roast an additional 15 minutes. Next you baste the chicken. The recipe I used the first time said to use the pan drippings. Well, there were only a few tablespoons of drippings and I burnt myself trying to get them out (I do not have a basting syringe thingy.) So I just melted half a stick of butter and poured it over that sucker. Delicious. This time I basted with a mixture of melted butter and wine. Roasted broccoli and cauliflower. I always use the precut kind, but you don’t have to. Mix flourettes of broccoli and cauliflower with olive oil, red wine vinegar and lemon juice and some herbs. 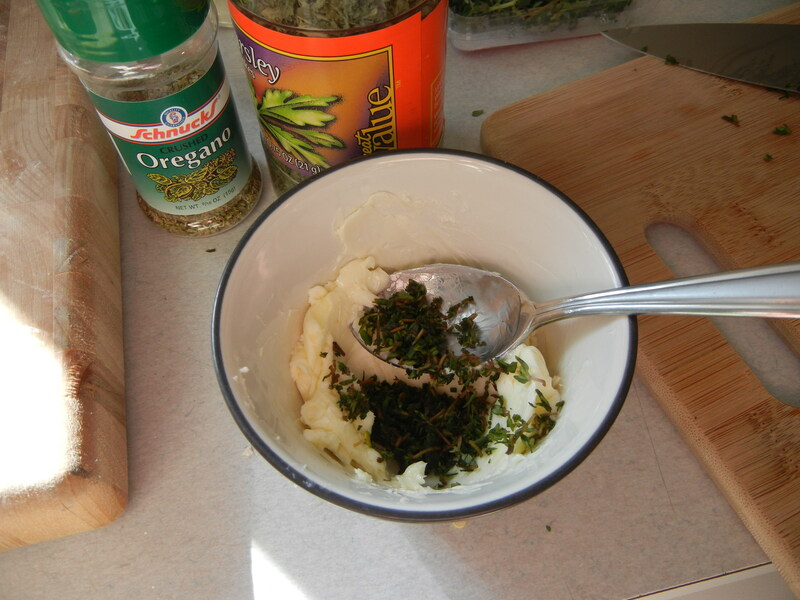 I like to use oregano, garlic and some cayenne pepper or red pepper flakes. Put in the oven in a casserole (I suggest lining it with parchment paper) and bake for 30 to 45 minutes around 450 degrees.